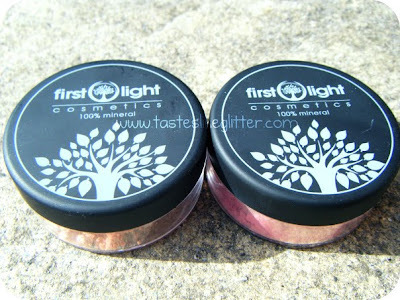 I was recently contacted by First Light asking if I would like to try some of their products. They let me look around the site and decide on what I would like. That seemed a plus for me since some companies just send out the same thing to everyone. You can read about it on the site, but a bit about the brand. The brand is 100% natural, pure crushed minerals. Their products don't contain chemicals, talc or fillers. They also provide samples. How many times have you ordered something and then decided that actually, it really doesn't suit you? It's a good way to try lots of different colours or if you're on a tight budget. I have some eye products but I'm doing a separate post on those, as I don't want this to be super long. "I'll have what she's having!!" 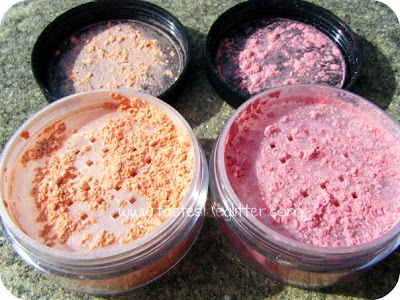 Our 100% mineral blusher is as gentle as a breeze, kissing your cheek with silky sheer colour. For a natural, healthy flush that releases your inner radiance! 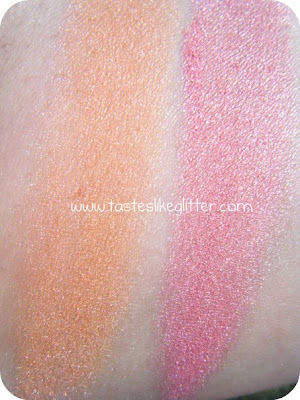 Mistral is described on the site as a light peachy pink with a hint of shimmer. This was the first thing I decided on as it's nothing like anything I currently own. I was expecting this to be the one product I didn't like but I actually do. It's perfect for Summer, when you don't want to be wearing a ton of makeup. It can be very natural looking, even with the shimmer. It's hard to pick up blush in photos but I recently used it in this FOTD. It's a refreshing change from pink and I really like it. 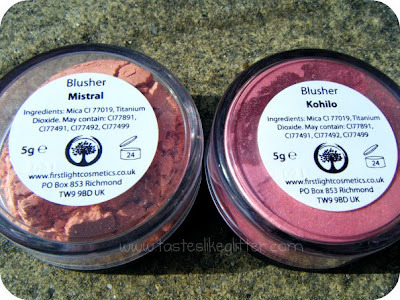 Kohilo is described as an air kiss of pale shimmery pink for any skin tone. I was expecting this to be as pale as M.A.C's Well Dressed. It's actually a bit more brighter then that, more of a light candy pink. I like wearing this with hardly any other make up, it provides that naturally flushed look. I also got a 15% off discount code for all my lovely readers. The code is valid until the 8th of April. You just need to enter First1019 when checking out and your 15% will be deducted from your total price (not including P&P). Let me know if you get anything!